Garage doors make up more than forty percent of your home’s exterior, it is important to not only choose a door that compliments your décor, but is also safe and secure. We have a wide selection of standard garage door sizes at the right prices. Custom size and standard size doors are available to view at our showroom. Here are some basic tips to help you choose the right door for your home. Now you can choose based on budget meranti wood, Aluzinc (Steel) Chromadek, Roll-up garage doors or Aluminium. Wood is one of the more popular materials, but there are some things you need to know. They require much more maintenance in comparison to other materials. To keep your wooden garage door in mint condition they have to be oiled with a good quality exterior oil every 3 to 6 months. The advantage of wood is that there is no comparison to the warmth and look of real wood. The thickness and construction of wooden doors are usually more stable than other door types. The garage door prices vary so call us for design and quote. Aluzinc doors are another option. They are strong and durable, lasting through the test of time and they are able to stand up to extreme temperature. You can buy them in many styles, and the biggest advantage is they are virtually maintenance free. When you are on a tight budget this is the ideal door that combines style and affordability. Aluminium, more durable, robust and lightweight compared to Aluzinc but a fraction more expensive. On the other hand, like aluzinc, they are available in a number of styles and are not susceptible to the elements. The great advantage of having an Aluminum garage door is that it requires very little maintenance, and can be power washed. The next thing to consider when picking out a garage door is insulation. While you may live in South Africa, where the temperatures are on the warm side even in the Winter, insulation keeps out hot air as well. The higher the R value rating of the insulation, the better protected your garage will be, meaning that is will remain relatively cooler in those hot summer months. There are a number of different factors when it comes to buying new garage doors. Once you have decided on the right material, insulation factor, and style, the next step is ordering your door. It is important to carefully measure the size of your opening and the space around your garage door. For more information give us a call. If you are unsure of your sizes we can arrange a site visit and create detailed drawings. Garage door prices vary depending on the type of door as well as all the accessories. 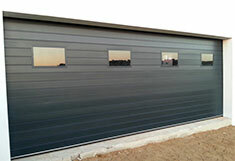 The prices for single Aluzinc doors start from R 7800 all inclusive and R 10500 for wooden doors. Please feel free to call us for a price on your new garage door. Here at Rightfit you can view our wide range of doors online. More colours, custom designs and garage door types are available to suit the look of your home. We will be happy to send you any garage door prices that you might require. Most homes have a standard garage door size and because of that the prices can be kept at an affordable level. We also custom make our wooden garage doors to fit any size of entrance including the creation of a front door that will look the same as your garage door. 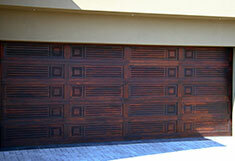 We have been one of Pretoria’s leading garage door companies especially with our custom hand carved wooden doors. We have a wide range of styles and can create an entire customised design as well. Our garage door packages include the installation and motorization with remote controls. 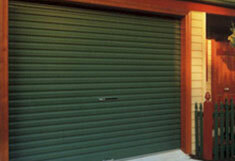 The garage doors for sale at Rightfit include, wooden, aluminium, roll up and aluzinc. Our full range can be found at our showroom in Pretoria. 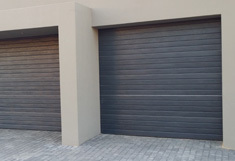 If you are looking for garage doors for sale in Pretoria contact us today for your free quotation.